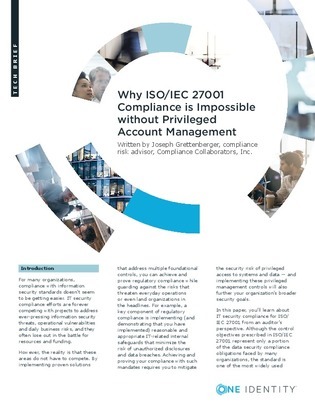 ISO/IEC 27001 compliance is impossible without privileged access management. In fact, 28 out of the 35 control objectives listed in ISO 27001 Annex A, either imply or explicitly address privileged access management. Access this white paper to learn how privileged access management is critical to ISO/IEC 27001 compliance to establish, implement, maintain, assess and continually improve a robust information security management system (ISMS).